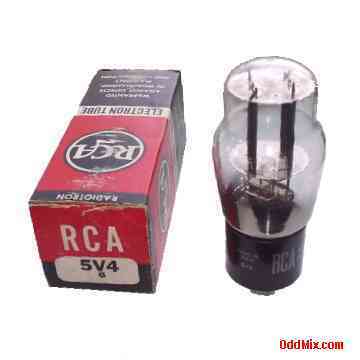 This is a genuine, vintage RCA 5V4G Radiotron Full-Wave Vacuum Rectifier electronic tube shown with it's original box. The 5V4G was developed for use in power supplies, amplifiers and other electronic equipments requiring high dc voltage. Excellent as a replacement for older tube type oscilloscopes, amplifiers, other equipments and for those antique radio or television restoration projects or to set up a private vacuum tube museum. Tube data for reference only - no longer available!